Just five walkers arrived at the deserted the car park by Grimwith Reservoir on a damp and very windy day. 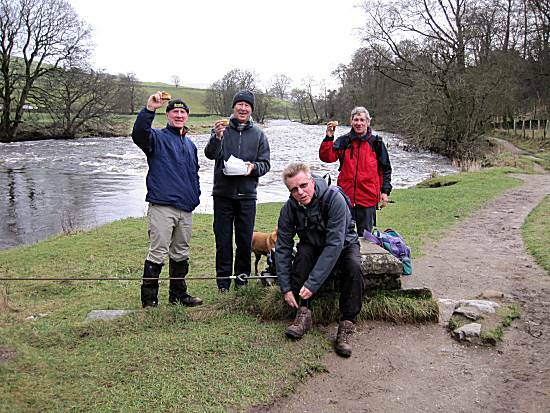 Ron's bacon and sausage butties were devoured with great gusto before they set off to circumvent the reservoir. 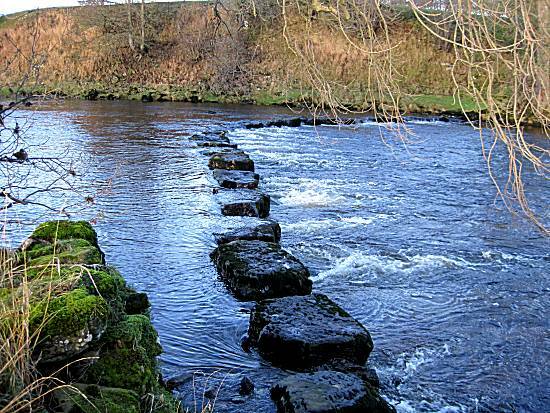 They watched the giant 'rollers' breaking against the shore, before heading off cross-country in the direction of Burnsall. 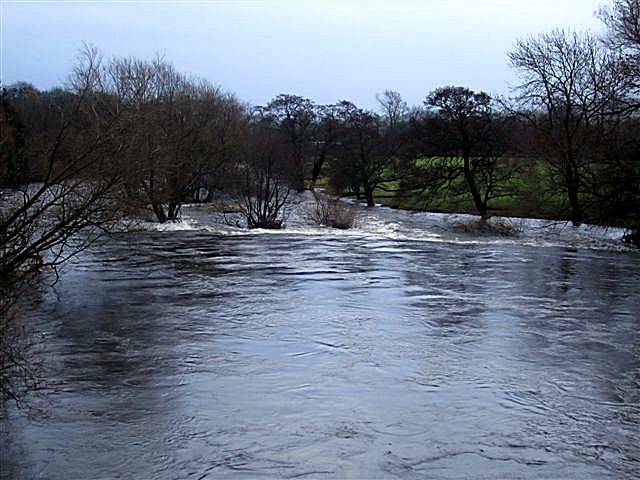 The walkers were relieved to see Burnsall in the distance, before heading towards the suspension bridge to enable the crossing of the fast flowing dangerous river. 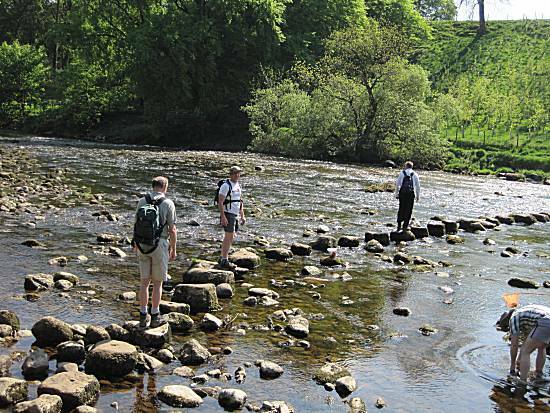 The walkers were seen in high spirits, as they successfully crossed the fast flowing river. On reaching the far side Neil permitted a celebratory Pork Pie stop and the walkers (except Ron) can be seen holding their pies aloft in triumph. The walkers quickly realised that their incredible speed would mean arrival at the Craven Arms in Appletreewick at 11-45am. 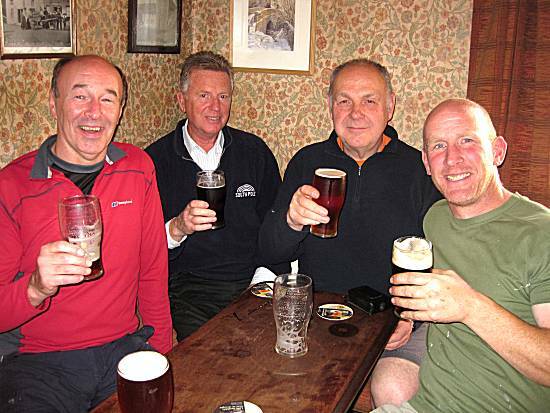 The walkers were not put off by this fact and quickly settled down in the warm surroundings to consume quantities of Thwaites Original (Except Colin & Ron). 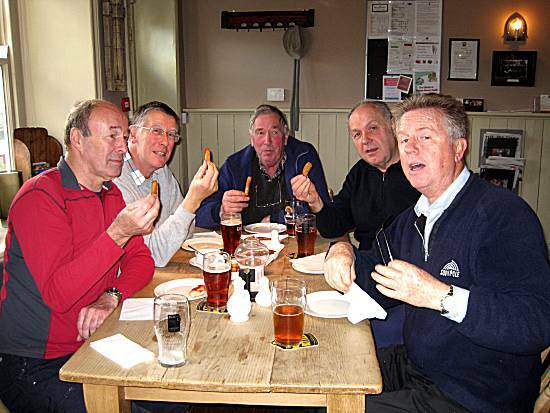 As it was Colin's birthday the week before, the walkers ordered chips, but were gravely disappointed by the portion size for the £11 purchase. A score of just one star was awarded. 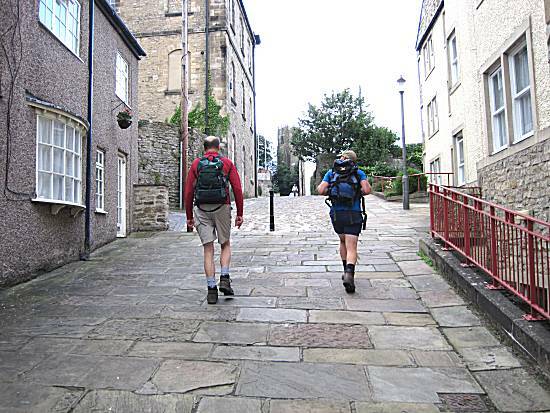 Aware that only two years earlier the walkers had left the pub too late to arrive back at their cars before nightfall, they decided to leave in plenty of time. 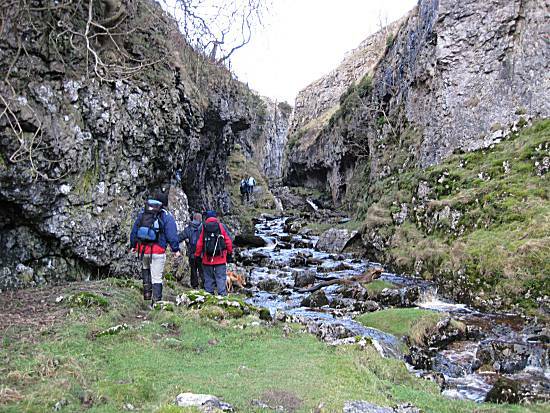 Only too quickly the walkers found themselves heading towards "Trollers Gill", however, they were confident of their superior skills. The leader ordered the walkers to take on extra sustenance and they stopped to consume their sandwiches and the remainder of Alan's Mars Bar Crispies. 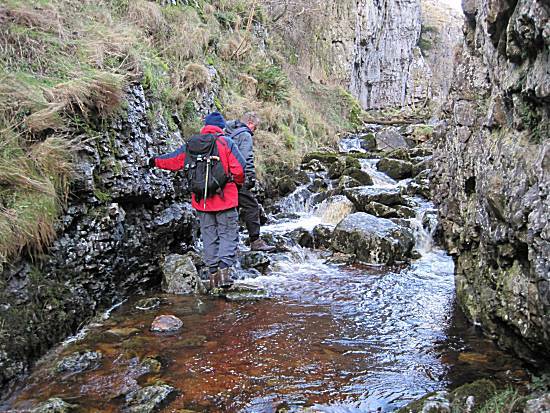 The walkers soon found themselves in treacherous conditions where using their extreme skills they avoided certain death in the fast running cold waters, by jumping from slippery rock to rock. 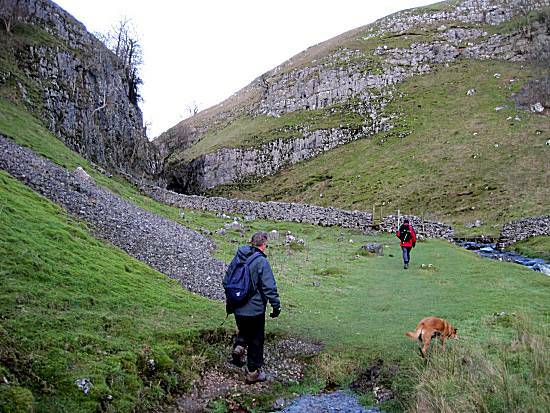 The walkers emerged triumphantly from Trollers Gill and headed upwards toward the main road, where the knew that only a short distance lay between them and their cars. 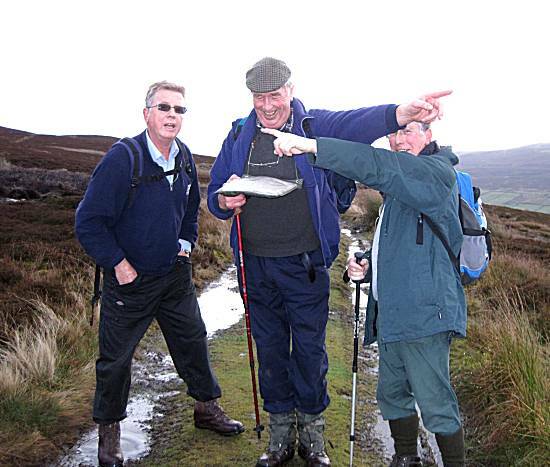 Navigation across the final section of the moor proved more successful than two years earlier, although the weather took a turn for the worse. 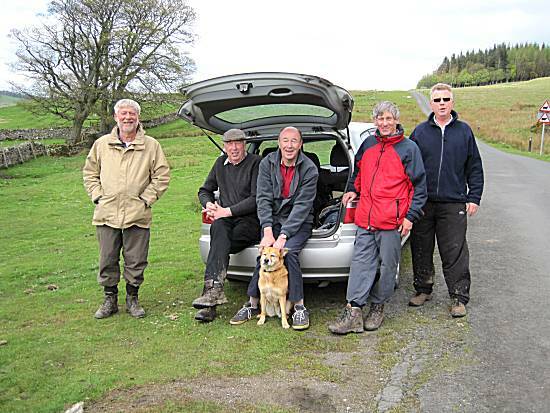 They were relieved to reach the cars back at Grimwith Reservoir after yet another difficult, but enjoyable walk. Weather: Cold, damp, muddy and very very windy. 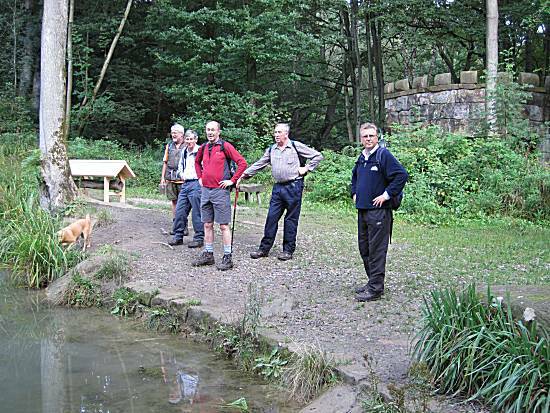 Seven eager walkers arrived at the car park adjacent to the Thornton Steward Reservoir, keen to taste Cliff's bacon & sausage butties, before setting off into the sleepy village of Thornton Steward. 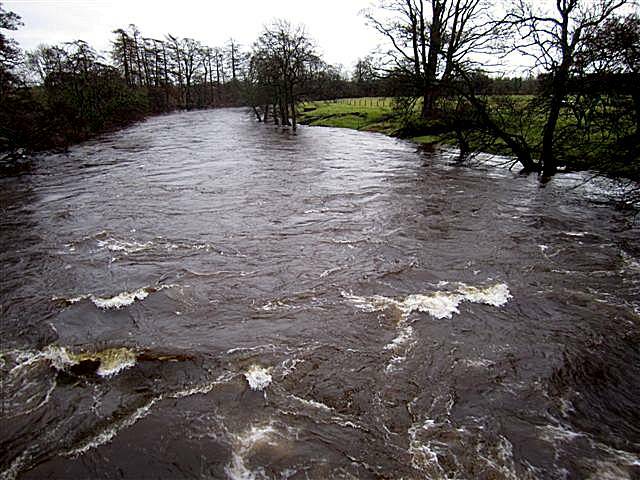 They quickly travelled down to Kilgram Grange, where crossing the River Ure they can be seen in high spirits. 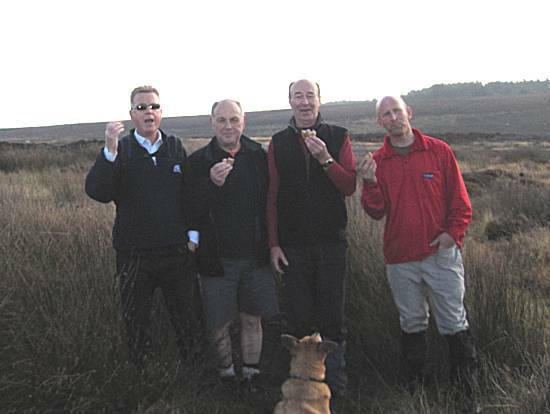 Before the walkers tackled the dangerously exposed and windy upper reaches of Witton Moor, the walkers wisely consumed extra supplies of Pork Pie and Mars Bar Crispies. Extreme cold winds were endured by the walkers as they headed onward, accurately locating the turn towards Witton Fell and finding some welcome shelter passing the forest sections. 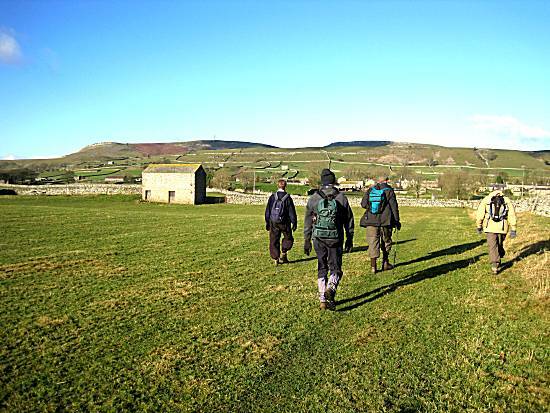 The walkers could not hide their extreme joy at seeing the Coverbridge Inn in the distance, as they gazed across the lower regions of Wensleydale. 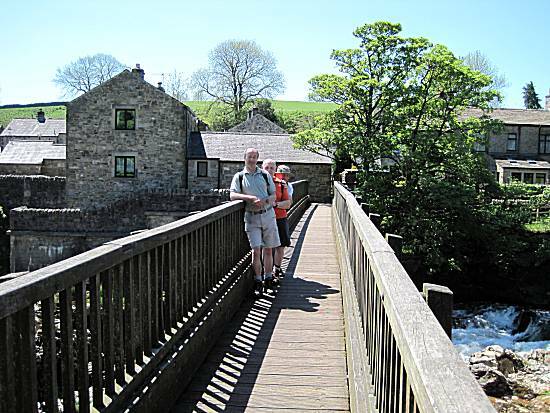 The walkers hurried down the road, soon to reach East Witton and locate the footpath by the church that was to take them the final stage down to cross the River Cover and arrive at their planned lunchtime stop at the Coverbridge Inn. 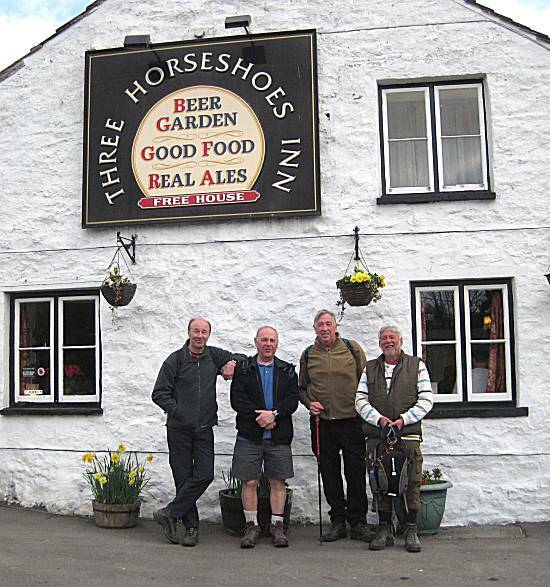 Plentiful supplies of wholesome ale, together with generous portions of chips were enjoyed at The Coverbridge Inn, but the walkers were only too conscious that a considerable distance lay between them and their destination. All the walkers, except Ella the dog, successfully crossed the swollen stream on a rickety bridge, and no disaster occurred. 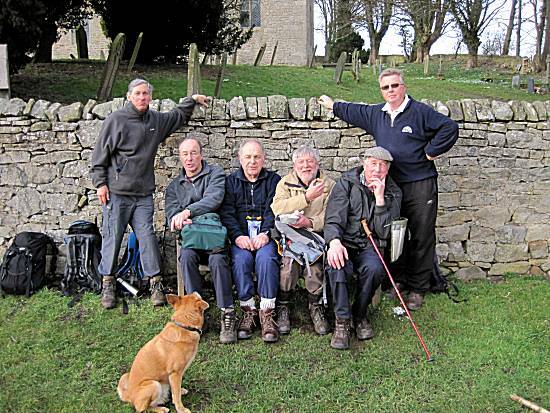 The walkers were pleased to have so quickly located the footpath back to Thornton Steward and stopped to consume further supplies of Pork Pie and Mars Bar Crispies outside the church, on a seat not designed for 4 persons. Weather: Dry with a little sun at times, but a cold biting wind. 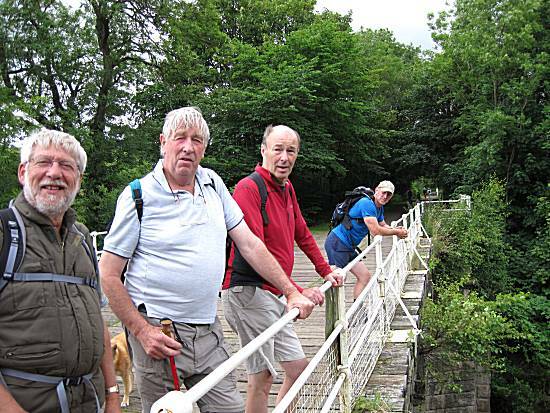 The five walkers arrived at the grass verge close to the level crossing at Finghall where they they quickly consumed Ron's excellent Sausage butties. 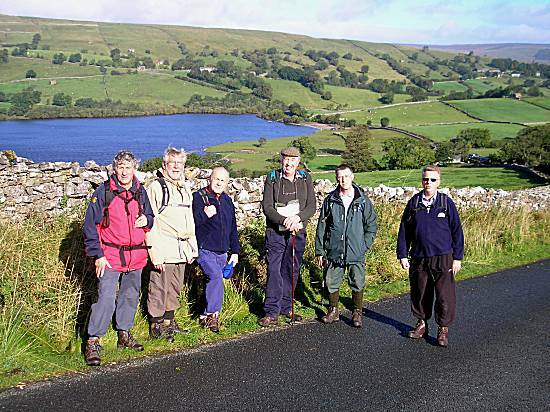 Alan led the walkers through Finghall and along the track towards Thornton Steward reservoir, before reaching the picturesque village of Thornton Steward. 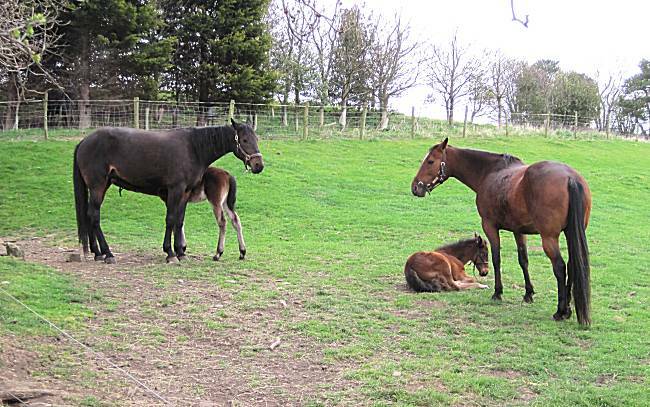 The walkers were careful not to disturb the young foals and their mares as they passed on their way to Danby Grange. The walkers looked longingly at 'The Coverbridge Inn' as they passed at an early hour. Rumours that it was open for breakfasts and coffees were dismissed. 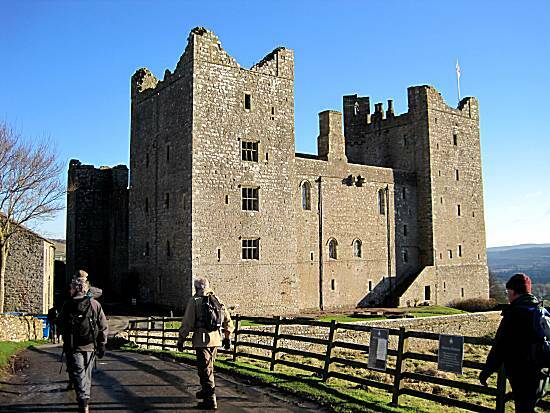 The walkers were anxious to learn more of the history of the Middleham Castle before heading up to the "Gallops", where they witnessed many race horses being exercised. 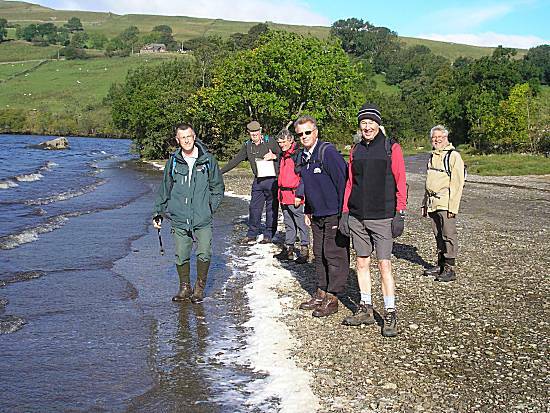 Whilst crossing the River Ure, on entering Wensley, they were delighted to see several Swallows that had been sent very early in the year especially to welcome the walkers to the Dales. The walkers were humbled by the sight. 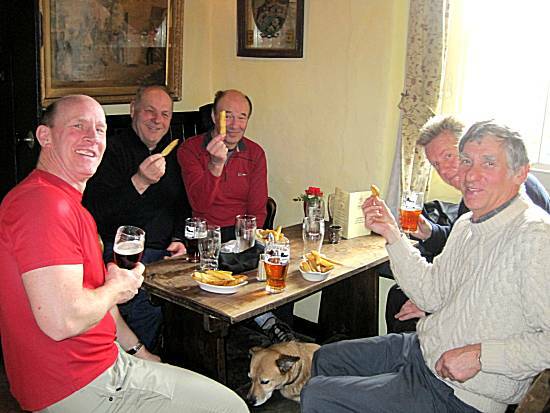 Much merrymaking was witnessed in the pub as the walkers celebrated the successful completion of the first section of the walk, with excellent chips. 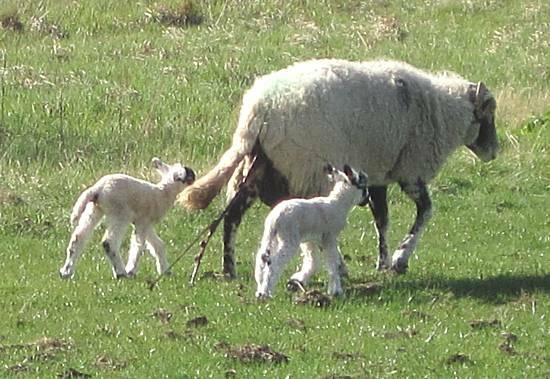 The walkers stood in amazement when they almost witnessed the birth of twin lambs. 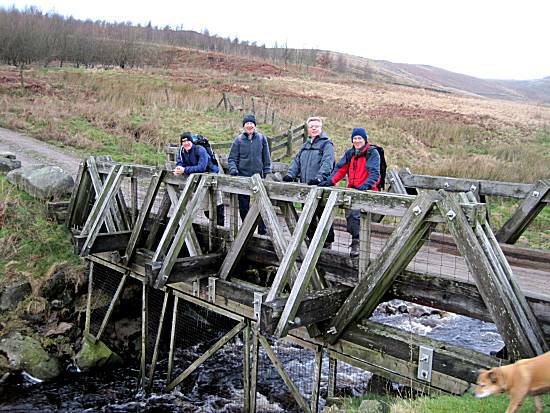 Characteristically the walkers located a bridge and proudly posed for a group photograph. Afterwards they hurried onward towards Redmire Station, fearful of missing the last train. The walkers were proud of their negotiating skills in managing to obtain a special group travel permit at just £2-50 per person. The rail authorities were of course aware that carrying such important passengers would draw in crowds of well wishers!! The level crossing man at Finghall was able to control the crowds of well wishers, as the walkers made their way the short distance back to their cars. 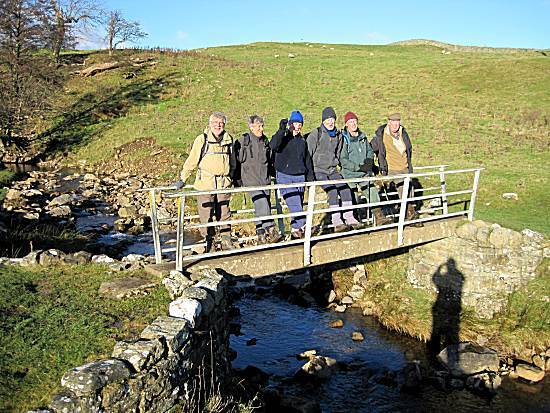 The walkers all agreed that this was an excellent and well led walk and vowed to meet again towards the end of April for another ground breaking walk. Weather: A little cold and damp in the morning, but turning into a fine afternoon. 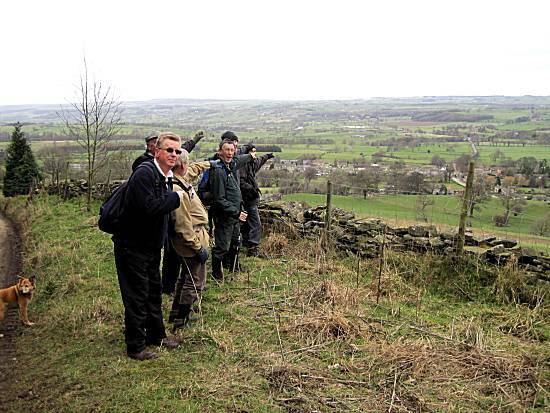 The walkers gathered adjacent to the Cattle Grid on the outskirts of Downholme at the allotted time, where they were delighted by Cliff's bacon and sausage butties with added fried egg. Despite the heavy rain on the journey to the start, they were pleased to note that the rain had stopped and they bravely set off without the benefit of full weatherproof clothing. Although the rain had stopped, the walk started wet underfoot and cold, but the walkers were ready for any conditions that they might encounter. Setting off through the village they located the footpath taking them down to the road, where they were quick to recognise the familiar junction heading towards Reeth. 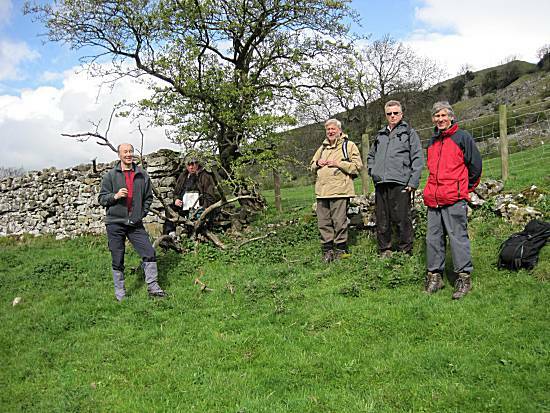 The route took the walkers through Maske and upwards passing Applegarth heading onwards towards Richmond. 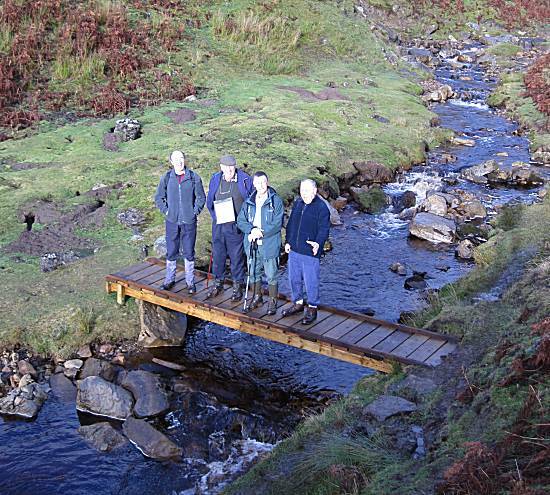 Ella, looked on with admiration, as the walkers proudly displayed their 'Pooh Sticks' before testing their competitive 'Poohing' skills. As the weather conditions improved, the walkers took the opportunity to take a short Pork Pie stop, before continuing towards Richmond. 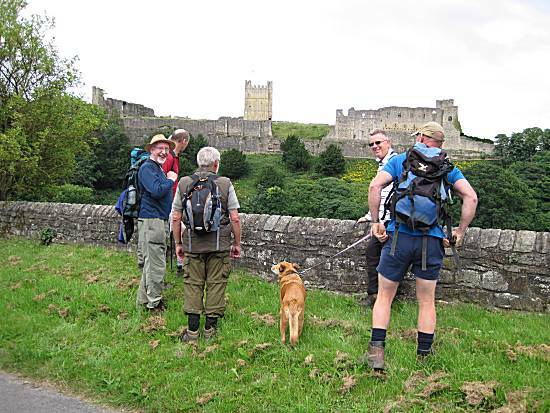 Having visited Middleham castle on their last walk, the walkers were keen to learn further fascinating facts about Richmond Castle. Crossing the river the walkers took the river path towards the infamous Hudswell Woods, where they searched for the start of the hidden climb of 311 steps up Hudswell Bank towards the village of Hudswell, where their lunchtime stop was planned. The walkers quickly and accurately located the George and Dragon, where much ale was consumed. 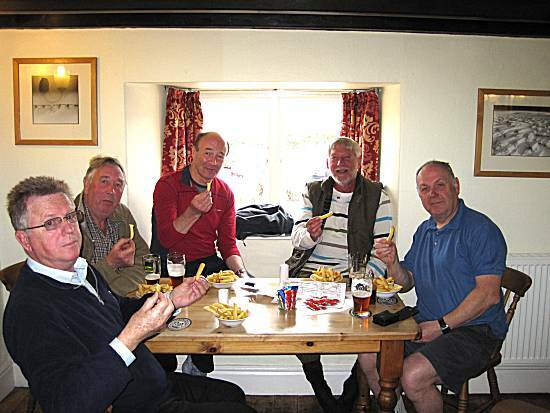 The chip negotiation resulted in 3 large bowls of chunky chips, served with ketchup and mayonnaise, which greatly met with the walkers approval, who awarded them the prestigious "5 Chip" score. The walkers very sensibly elected to take the road route back to the finish although they knew this would take them through Army practice land where they might encounter giant tanks and live artillery. However, the walkers dismissed the danger and continued onward. 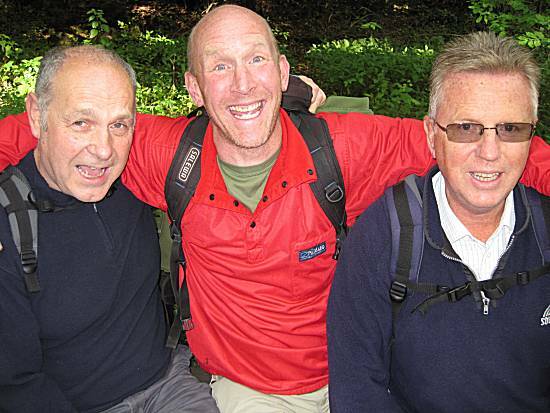 The walkers were seen in high spirits after completion of another daring walk planned by Cliff. 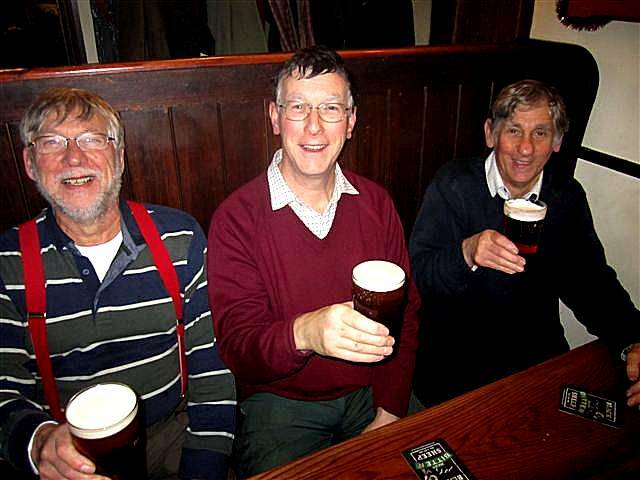 They agree to meet again during May to further test their walking and navigational skills through the Yorkshire Dales. Weather: Cold and damp in the morning, but no rain. Turned into a warmer and pleasant afternoon. 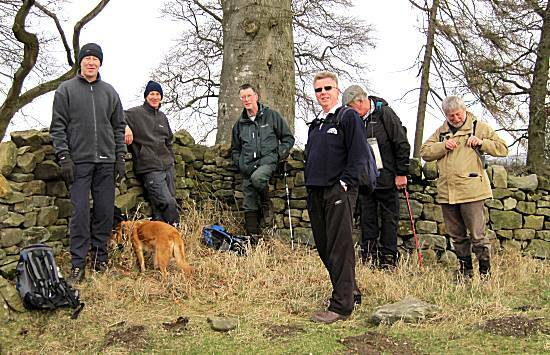 Walkers: Cliff (Leader), Neil, Andy, Alan, Colin & Ron with Ella the dog. 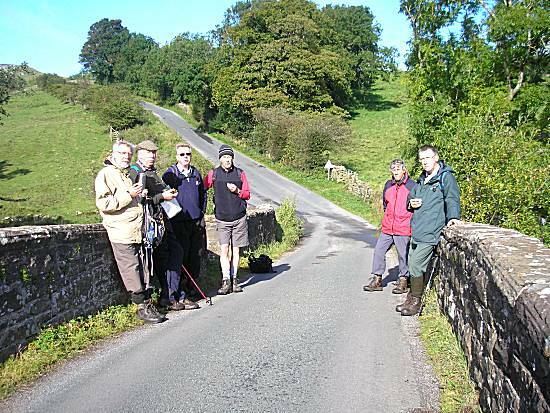 A depleted number of walkers, less the entire Thoralby contingent, arrived early at the usual parking place in Bursall and enjoyed Ron's special bacon and sausage butties (Gloucester Old Spot variety) before setting off over the bridge and up the steep bank towards the road heading northwards. 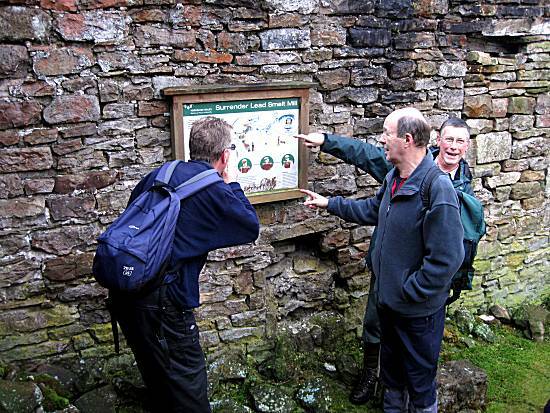 The route again took the walkers through a historic lead mining area, where the walkers were keen to advance their knowledge by reading all the information boards. 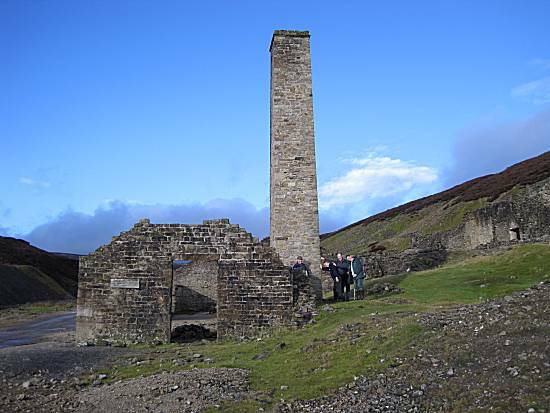 Continuing onwards they left the mining areas before turning south towards Grassington. 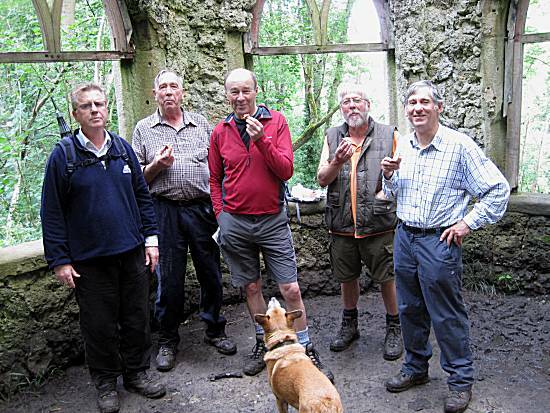 Wisely they stopped by the Lime Kilns to consume the first of their Pork Pie rations. 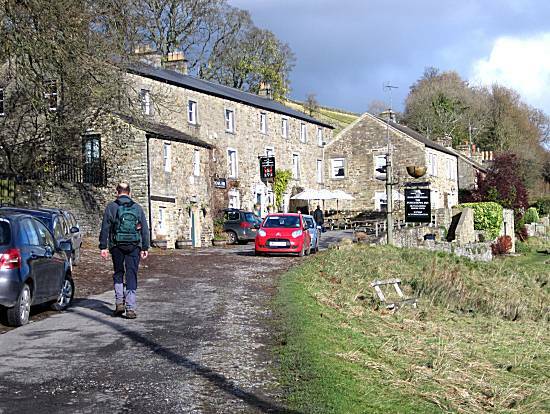 A revised route into Grassington soon found the walkers outside The Foresters Arms where they felt an urge to take quantities of Bombardier outside in the warm sunshine. 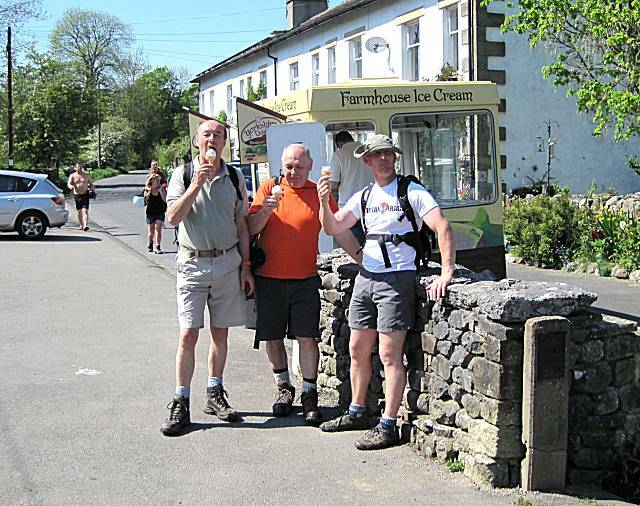 Leaving Grassington the walkers headed to Linton having heard stories of excellent beer at the Fountaine Inn. 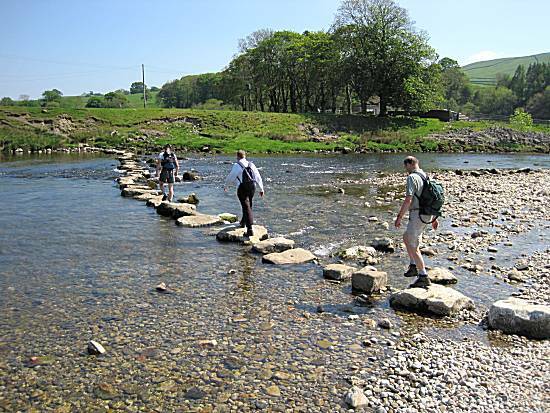 The walkers can be seen here crossing the river at the infamous Linton Falls. 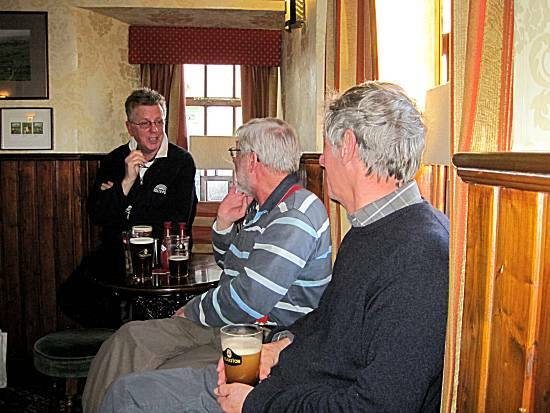 The walkers enjoyed their stop, sitting outside at the Fountaine Inn and choosing Thwaites Original. Responsibly, they agreed not to order chips, but quickly finished off their remaining Pork Pie rations. 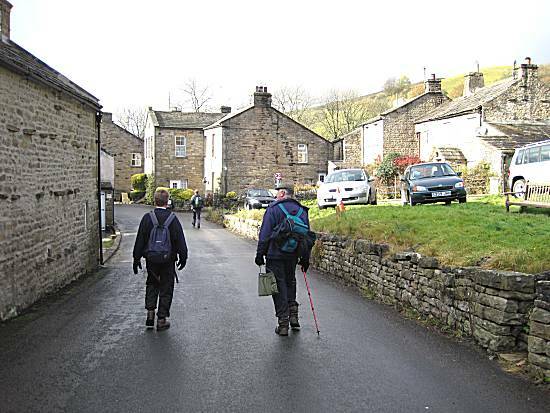 99's (Except Ron) were chosen by the walkers as they left Linton, heading back towards the river. Incredible views of beauty were witnessed by the walkers as they headed onwards in the full heat of the day. 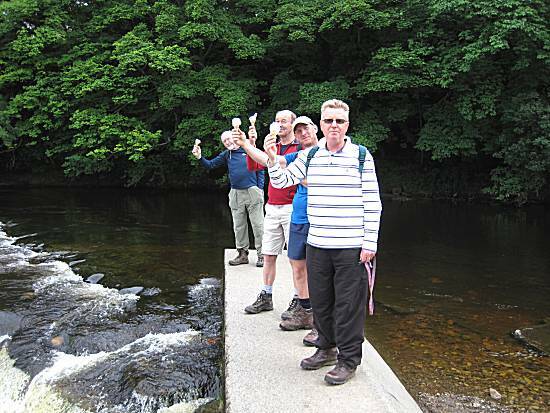 The walkers held their Mars Bar Crispies high in celebration of a successful crossing of the stepping stones. 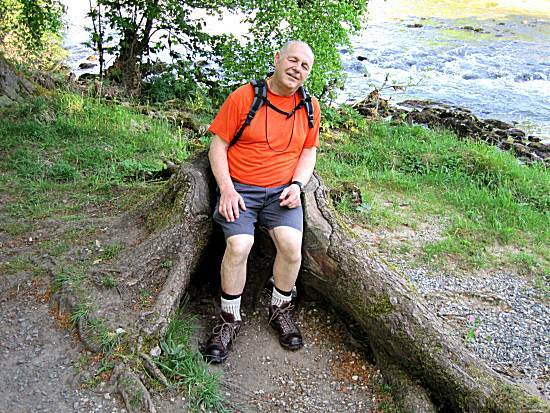 Alan was relieved to find a seat carved out of a tree stump where he could relax after the stresses of the day. 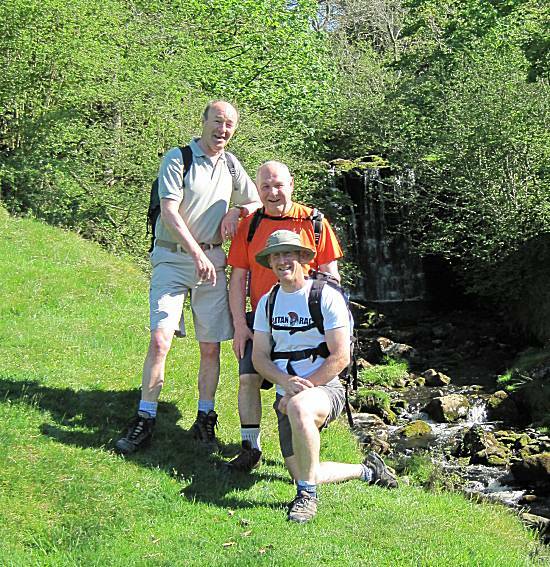 Walkers: Neil (Leader), Alan, Ron & Sean. 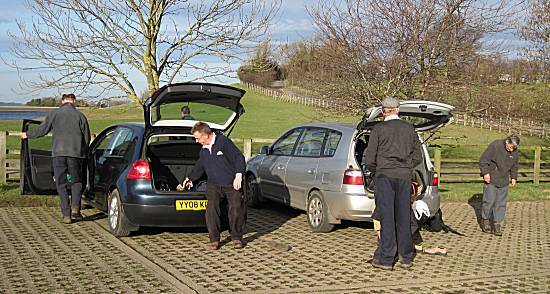 Seven eager walkers arrived at the Long Stay car park in Richmond ready to devour Cliff's excellent sausage, bacon and egg sandwiches. 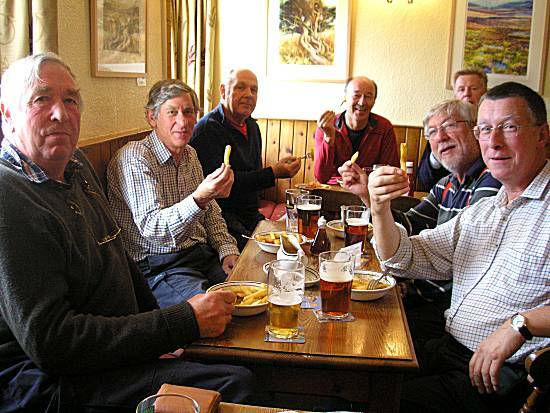 The walkers all agreed that served in sliced bread rather than rolls, added greatly to their enjoyment. 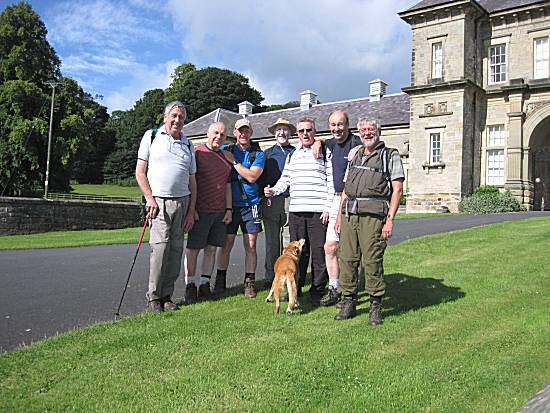 Tom lead the group out of Richmond via a new route up many steps, joining the familiar route across the disused race course and busy golf course towards Aske Hall. For security reasons the walkers chose not to stop outside Aske Hall, but instead gathered in front of the splendid stables for a group photo, before continuing on their journey. The route shortly left the comfort of their familiar surroundings to take a pathway into Gilling Wood. Tom took the opportunity to check his route, looked on by the other concerned walkers, but he remained confident at all times. 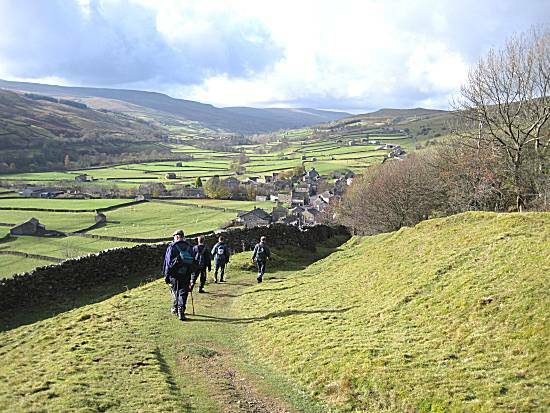 Cunningly Tom instructed the walkers to stop at the start of Richmond Out Moor, to take on additional strength promoting Pork Pie and Mars Bar Crispie rations, before tackling one of the most muddy and boggy sections of the walk. 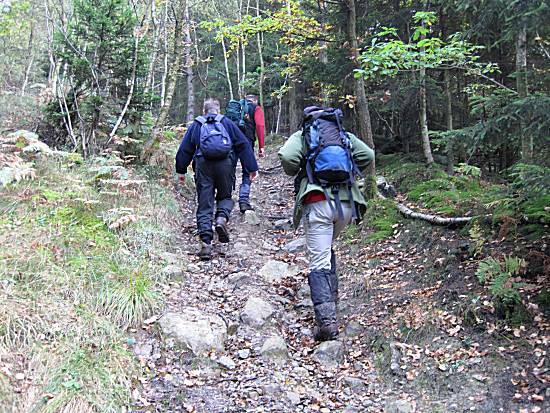 The heavily forested section of the walk proved difficult and greatly slowed their progress. 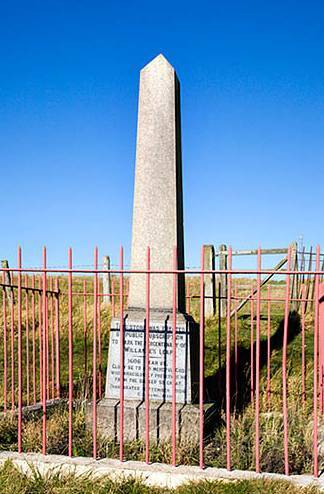 Triumphantly they emerged from the forest quickly crossing the road and hurrying to see the monument for Willance's Leap, eager to learn more. Tom led the walkers down along difficult pathways back through the centre of Richmond taking the route out up the hill towards Holly Hill. The walkers accurately located the Holly Hill Inn, where they feasted on excellent home made Chips and Black Sheep Ale. The staff provided television coverage so that they could watch Mark Cavendish compete in the Olympics. 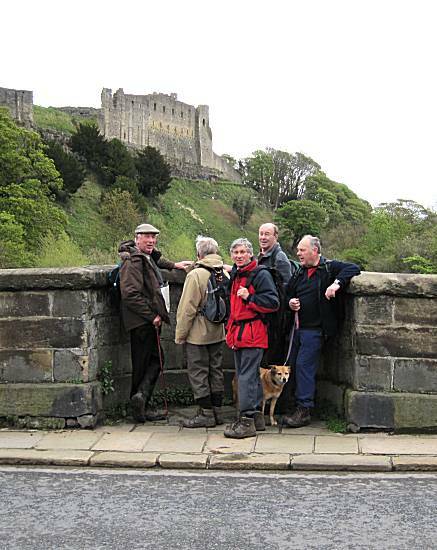 After leaving the Holly Hill Inn the walkers headed down to attempt to cross the fast flowing river beneath Richmond Castle. Tom provided the grateful walkers with 99's to assist their crossing of the river, but even to power of these proved inadequate!! 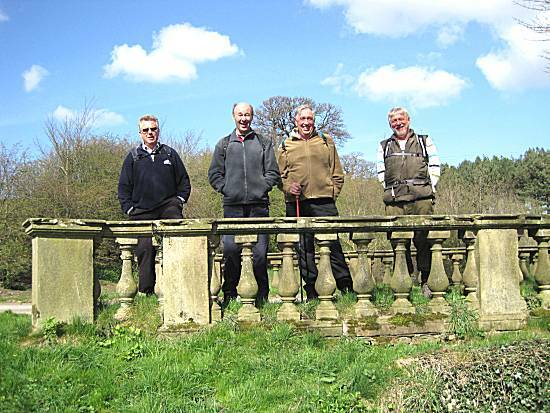 Instead the weary walkers cunningly located a disused railway bridge to cross the river, as they headed eastwards in search of the long lost Easby Abbey. 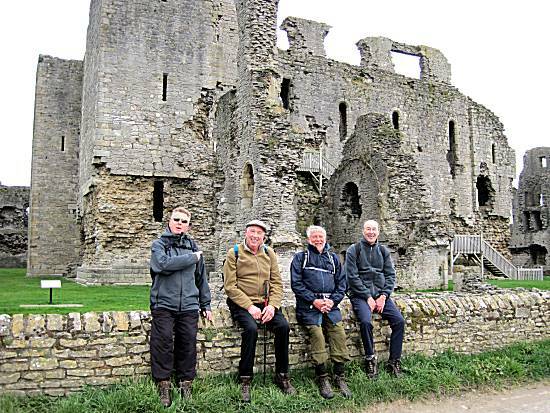 The walkers were unable to contain their excitement at finding the historic Easby Abbey. 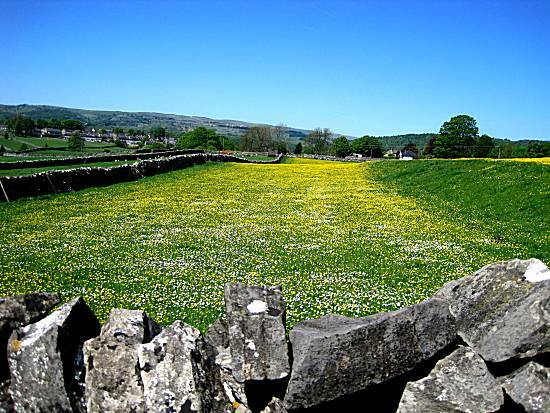 They quickly established that it was really The Abbey of St. Agatha, Easby, and founded in 1152. They also knew that in the late 1530s Henry VIII dissolved all the monasteries and the abbey was abandoned and left to fall into ruins, never to be seen again, until the walkers located it today. 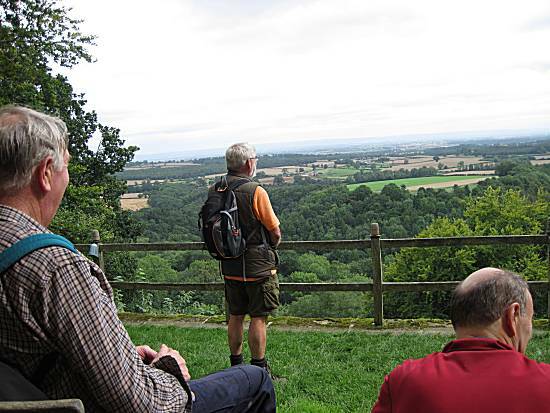 The walkers were pleased to get back to their cars and agreed to meet again in August for a further adventurous walk. Weather: Hot sunny day, but a little windy at times. 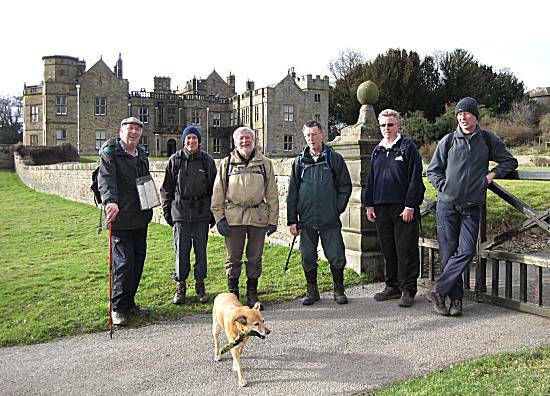 Walkers: Tom (Leader), Cliff, Andy, Sean, Alan, Neil & Ron with Ella the dog. 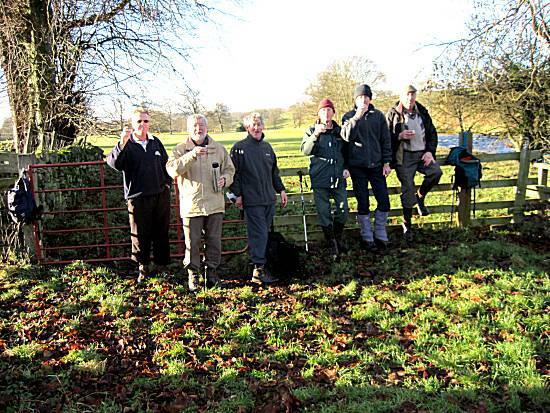 Five walkers met in the lay-by close to North Stainley waiting the arrival of Ron with his special Gloucester Old Spot bacon & sausage butties, which were greatly appreciated. They set off taking the customary detour through the caravan park and canoeing centre. 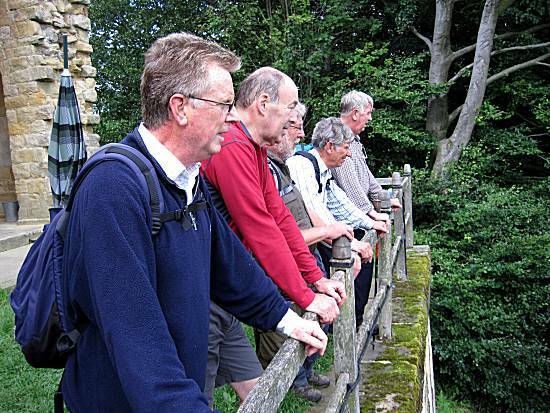 The walkers elected not to visit the Marmion Tower on arrival at West Tanfield and instead quickly headed off in the direction of Mickley. The woods proved to be very muddy and treacherous underfoot, but even these impossible conditions did not stop the walkers reaching their destination. DISASTER STRUCK!! When the walkers found their way blocked by a gigantic rock fall. However, under Andy's supervision and Ella the dog's concern, the walkers used their immense strength to clear the pathway. 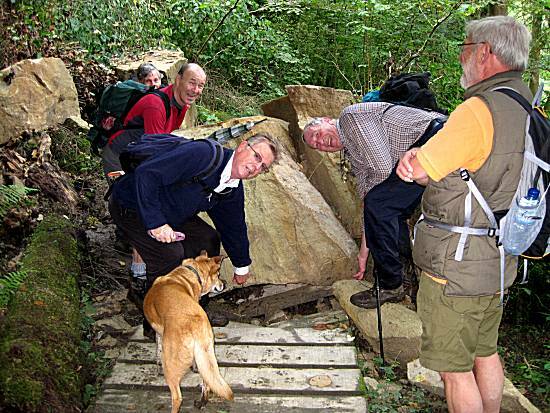 After the stresses of clearing the rock fall, the walkers were quick to locate the roofless round house in Hack Fall Woods to share their Pork Pies and Mars Bar Crispies. 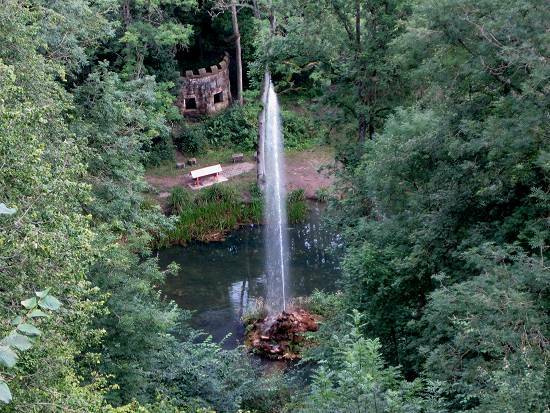 The walkers gathered by the Purple Pond where they learnt of stories of giant water spouts and agreed to locate the source. Patiently the walkers awaited the giant water spout and were not disappointed. 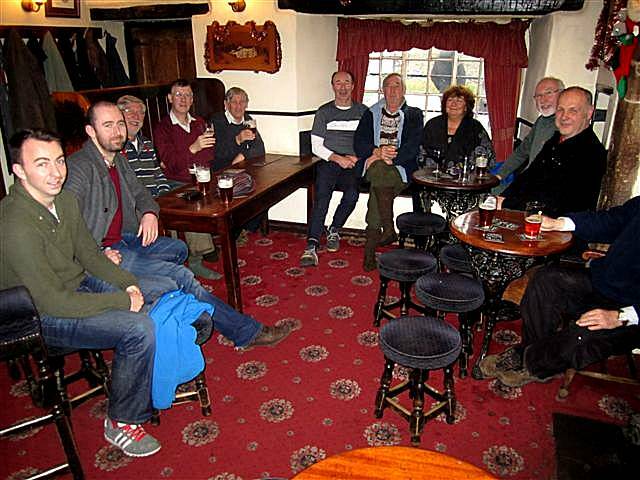 After leaving the delights of Hack Fall Woods, the walkers quickly made their way to the Crown Inn at Grewelthorpe, where they enjoyed Ringwood Ales (until the barrel ran dry). 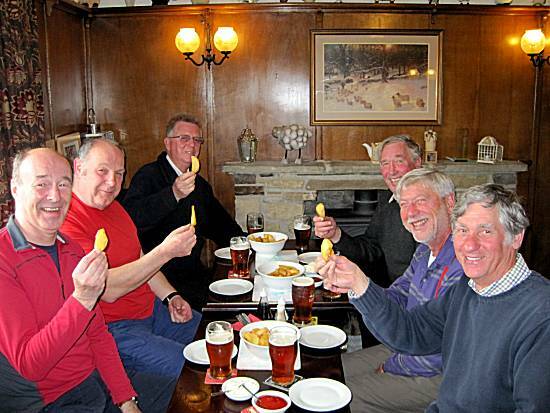 The walkers were pleased to note that the chip quality had improved considerably since their last visit and awarded them the maximum score. 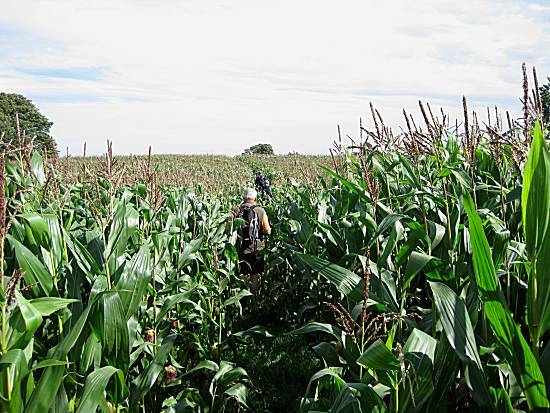 Considerable discussions took place in finding the correct route back to the cars after leaving Grewelthorpe, but the walkers quickly realised that the route had been cunningly hidden by a giant Maize field. Weather: Cloudy but warm, turning into a sunny afternoon. 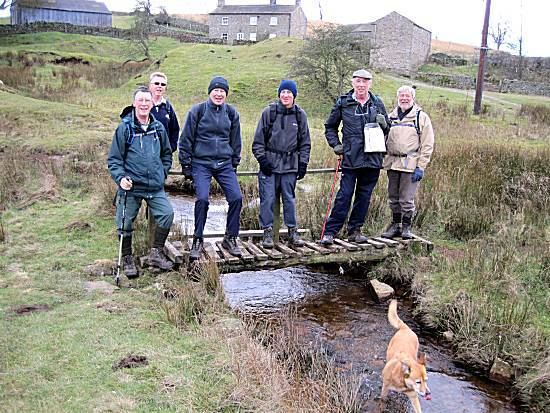 Walkers: Neil (Leader), Cliff, Andy, Alan, Colin & Ron with Ella the dog. Seven eager walkers met in the quiet village of Thornton Rust, quickly devouring Cliff's egg, sausage and bacon sandwiches, before setting off down the road admiring views Thornton Scar before reaching the farm buildings at Cubeck where they took the, muddy in places, footpath past Brough Scar to reach the road out of Bainbridge. Here they elected to take the road route towards the giant TV aerial mast onto a rather exposed and windy Blean Lane. At this point the cunning walkers spotted a massive lake in the distance and agreed amongst themselves to investigate it further. Continuing along the road the route took them through the hamlet of High Blean. 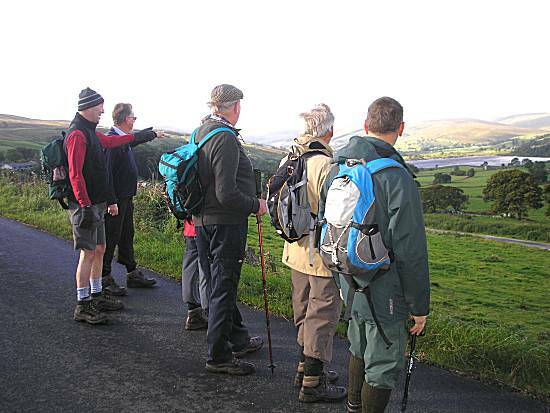 The walkers elected to take the little used road down towards Countersett and soon got their first good view of the giant lake, which having discovered it, they decided to call Semer Water. Proudly they assembled for a group photo. 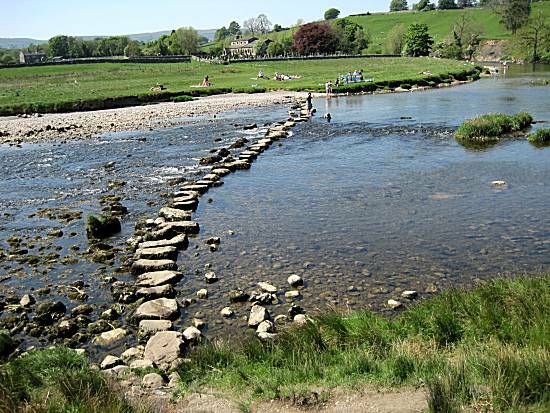 The walkers could not hide their excitement at being able to paddle on the shores of Semer Water, before heading up the steep hill in search of a long lost Roman Road. 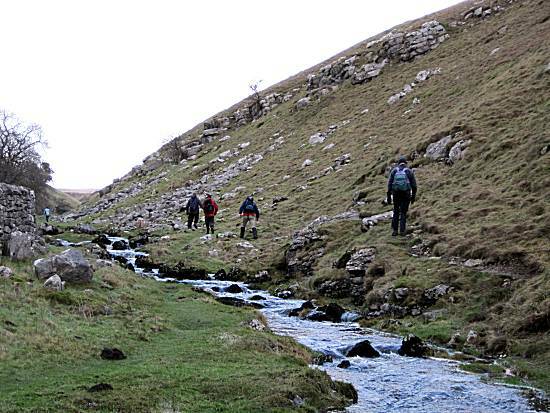 Crossing the shortest river in Britain - The River Bain, the walkers cunningly stopped for Pork and Game Pie followed by Mars Bar Crispies. 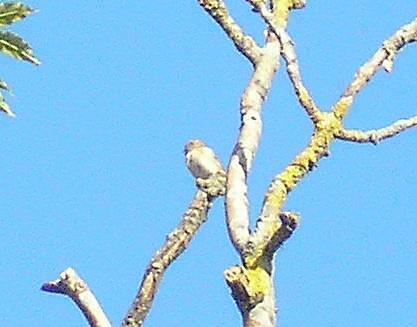 A walkers were humbled to see a rare bird had come to visit them. Not exactly sure of the breed they vowed to carry out further research. 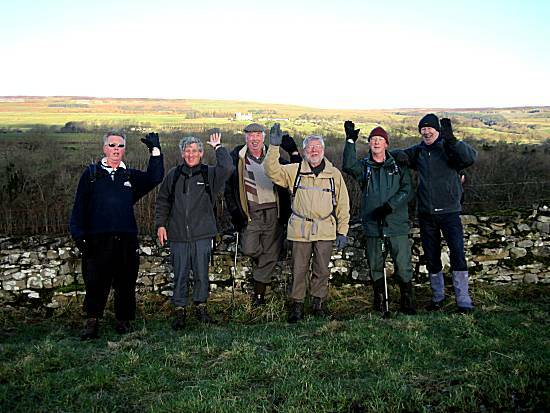 The steep climb up Crag Side Road the road passing the village of Countersett presented no difficulty for the experienced walkers After walking a short section of very muddy footpath they were jubilant to discover the long lost Roman Road, which they promptly named Cam High Road. 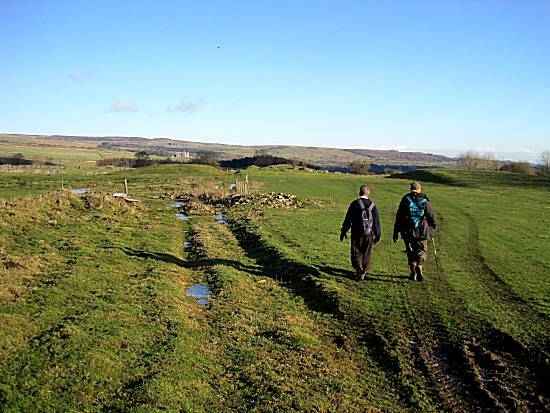 As they walked the road into Bainbridge, they imagined the numerous Roman Soldiers that must have walked this route and were proud in having rediscovered this for the nation. 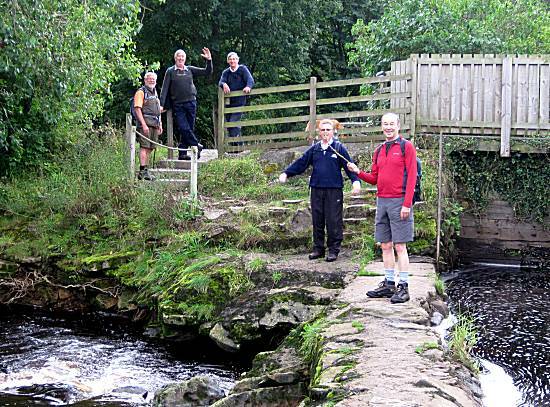 The walkers continued into Bainbridge where there were disappointed to note that the Archimedes Screw generating system was not operating. Unperturbed they continued to the Crown Inn at Askrigg where they chose to stop for lunch. Here they found the Black Sheep Ale (except Ron & Cliff) to be of a good quality, whilst Alan negotiated a chip deal with added gravy!! The walkers were well satisfied. 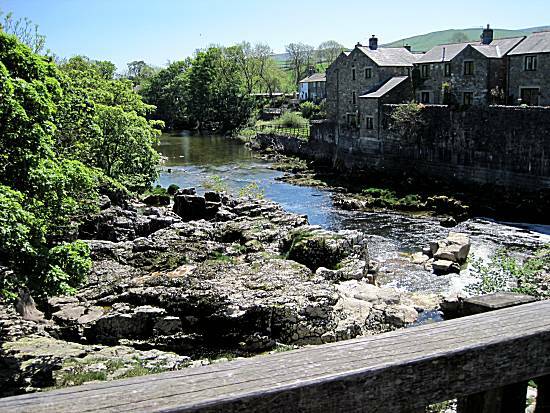 The short journey back to the cars at Thornton Rust proved uneventful, crossing the River Ure at Worton Bridge and passing the closed Victoria Arms. The exact route through the fields was again not clear and much climbing of stone walls and barbed wire fences was necessary before they reached their cars. 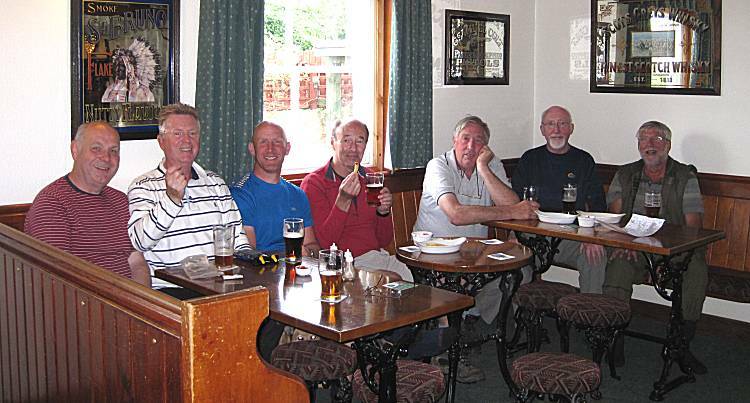 Walkers: Cliff (Leader), Andy, Paul, Alan, Neil, Colin & Ron without Ella the dog. 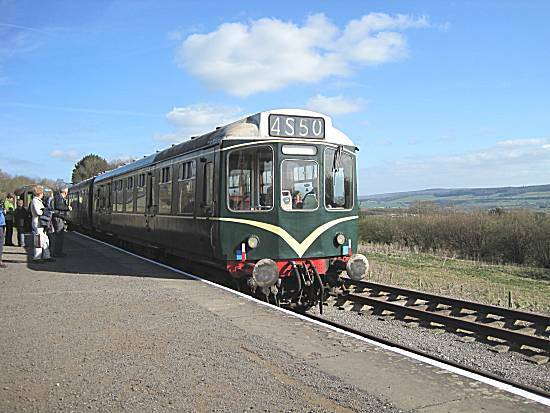 Distance: 15miles - Levisham to Grosmont, via Goathland. 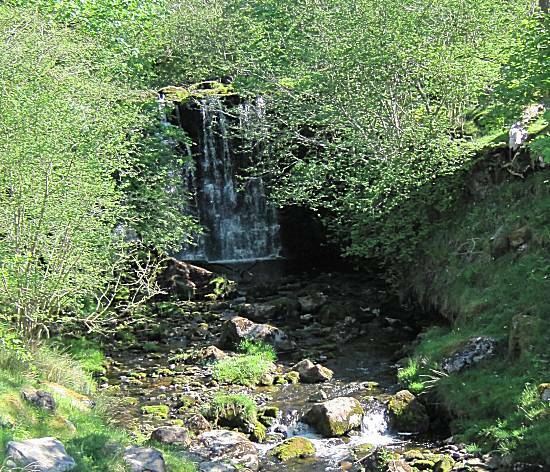 Lunch stops at "The Mallyan Hotel" and "The Birch Hall Inn" Beck Hole, with a steam train back to Levisham. 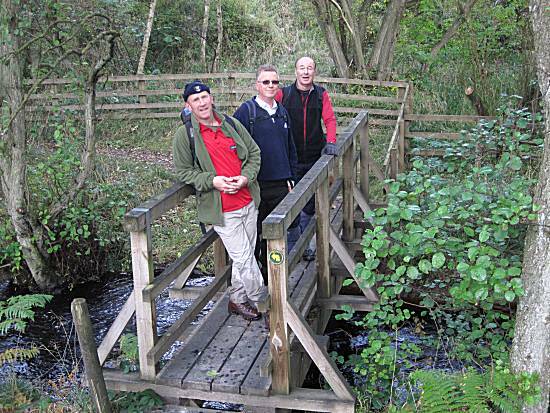 After a summer of torrential rain, only four walkers were sufficiently brave enough to attempt this difficult walk. Wisely they chose to walk from Levisham to miss the muddiest section of the walk. 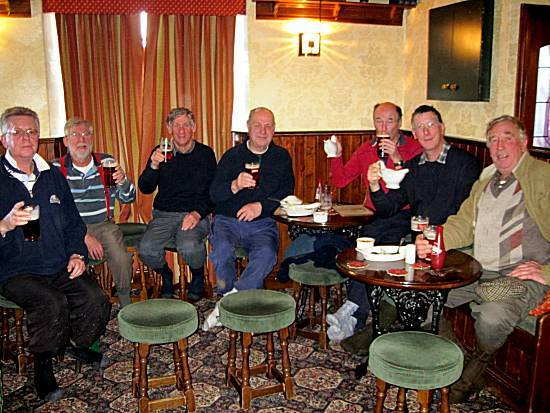 Ron offered to collect the walkers, who arrived at Levisham at an early hour. They were dismayed to find station had been taken over by a German encampment, but quickly found a parking spot by the road. 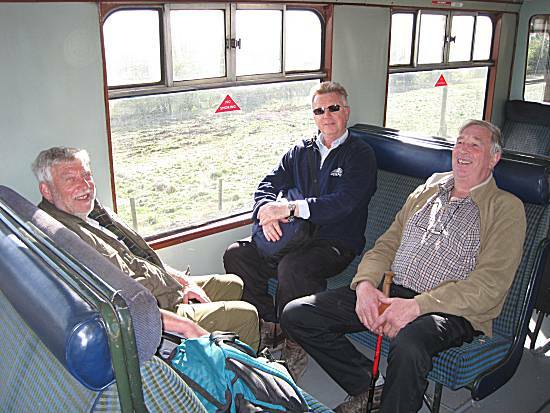 Ron's bacon & sausage sandwiches were greatly appreciated, before they set off towards Newtondale halt. Only too quickly they came across the pathway down towards Newtondale Halt and after some debate headed downhill carefully negotiating the slippery steps, gathering on the bridge for a group photo. 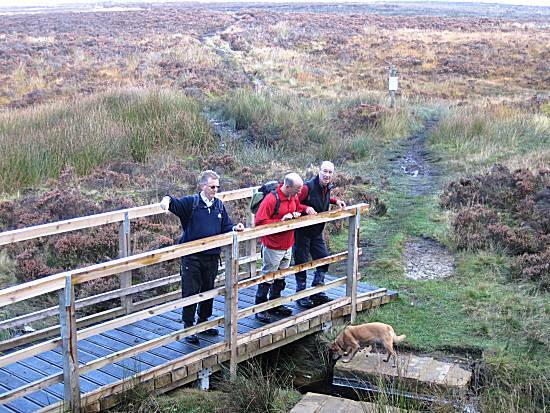 The walkers were amazed to find that the authorities had constructed a new bridge to assist the walkers gain entry onto the moor. 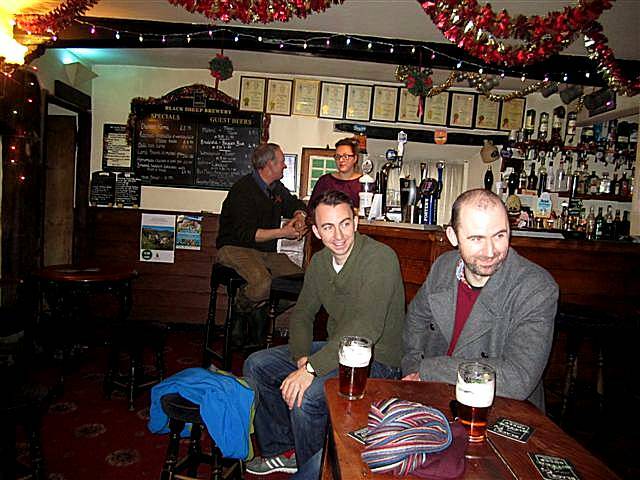 Breaking from tradition and in recognition of their incredible performance, the walkers rewarded themselves with a number of pints of Timothy Taylors ale in the Mallyan Spout Hotel. Leaving the hotel they chose to take the footpath down to the river, quickly arriving at the bottom of the incline and making their way to "The Birch Hall Inn" at Beck Hole. 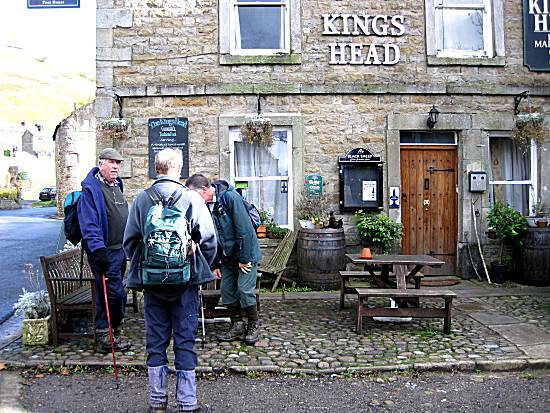 The Birch Hall Inn proved popular with the walkers, who enjoyed Black Sheep Ale and Pork Pie with Pickle dinners, instead of chips. 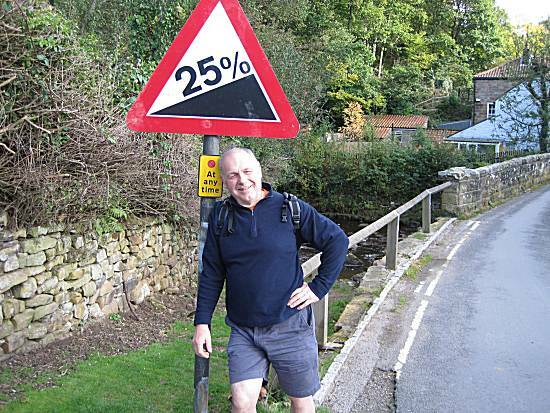 Alan felt at a low percentage when leaving Beck Hole, but soon recovered sufficiently to take the footpath to Grosmont. 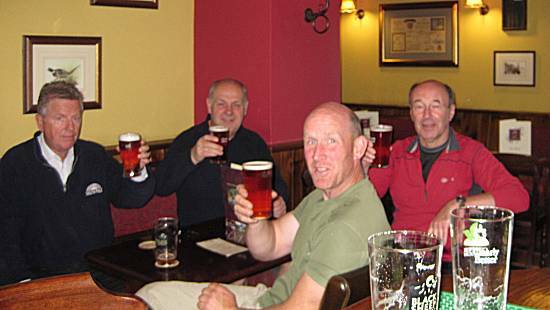 The Station Hotel in Grosmont proved impossible to pass, whilst the walkers waited for their train back to Levisham to be prepared for them. 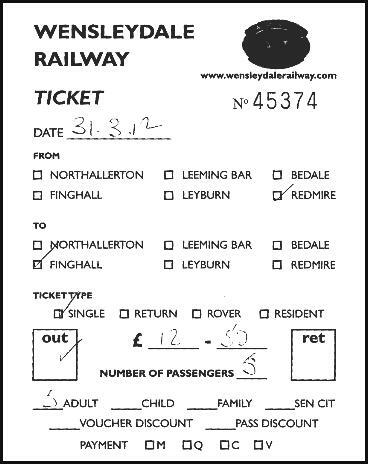 Breaking a long tradition, the tickets had to be purchased on board the train, which swiftly transported the tired walkers back to Levisham. They quickly took the roadway away from the station and up to Ron's car, where he transported the walkers back to their homes. 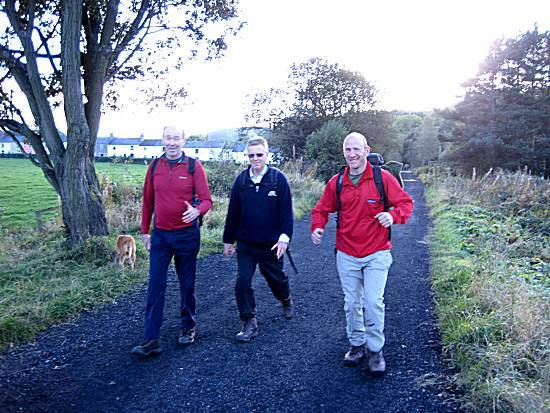 Walkers: Neil, Sean, Alan & Ron with Ella the dog. 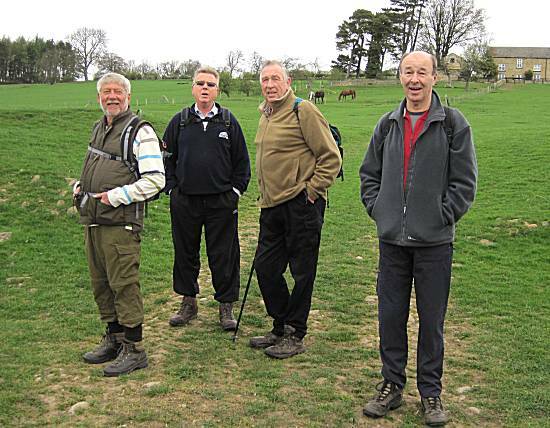 Just five walkers arrived on the green in Healaugh anxious to devour Ron's bacon and sausage sandwiches, before setting off through the village and up the steep track towards the moor. However, only too soon, considerable confusion was witnessed as our leader attempted to navigate through the confusing maze of pathways leading to where there were rumours of a long lost lead smelting mill. Before they left they named their smelting mill "The Surrender Lead Smelting Mill" and affixed a plaque so that others could benefit from their considerable knowledge. The walkers were proud of their achievements as they left the mining area in the distance. However, looking back they were only too aware of the amount of rebuilding that would have to be undertaken on their next visit. 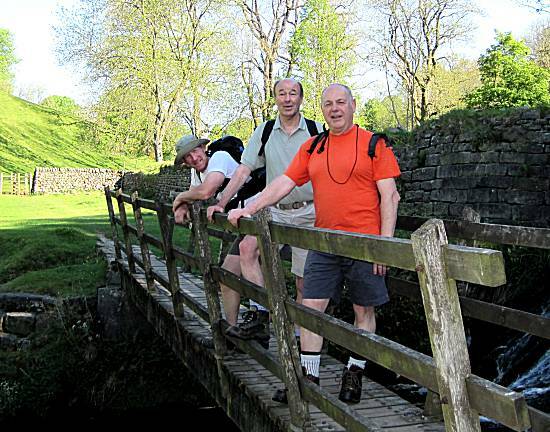 The walkers were relieved to find a bridge and characteristically posed for a group photo. The walkers were devastated to find that the pub has closed just 3 days earlier, leaving the village with no drinking facilities. Cliff rapidly took command of the difficult situation and narrowly avoiding a mutiny, quickly redeemed himself by instructing the walkers to follow him to Low Row some 3 miles away. 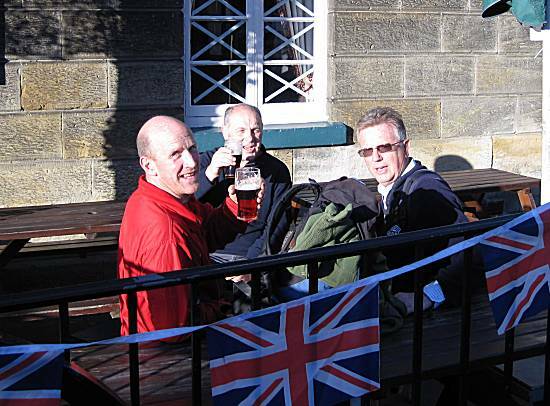 The thirsty walkers eventually arrived at the Punch Bowl Inn in the continuing sunshine. 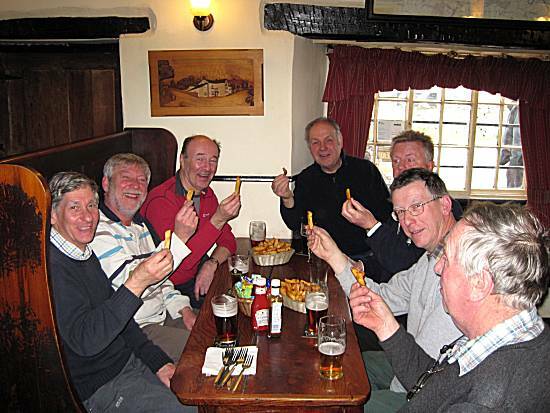 The walkers enjoyed Black Sheep ale whilst they feasted on excellent and plentiful chips of a particularly high quality. They left knowing that supplies of Mars Bar crispies remained healthy. Because of the change of lunchtime venue, the walkers only had a 2 mile walk to return to their cars at Healaugh. They admired the exceptionally well presented old village phone box and noted that it now contained silk flowers instead of fresh. All recognised that Cliff had produced an excellent walk despite the disaster in Gunnerside and agreed to meet again on the 1st December. 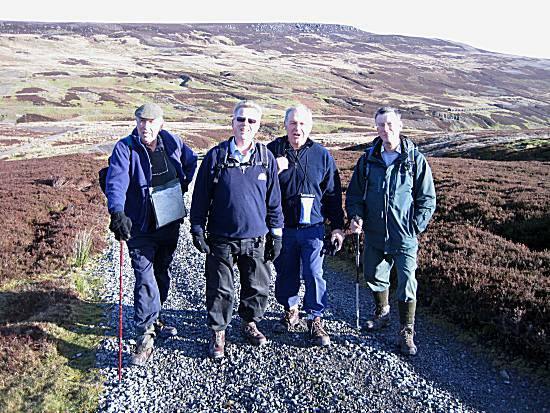 Walkers: Cliff (Leader), Paul, Neil, Alan & Ron without Ella the dog. Weather: A cold and almost cloudless day, with much sunshine. 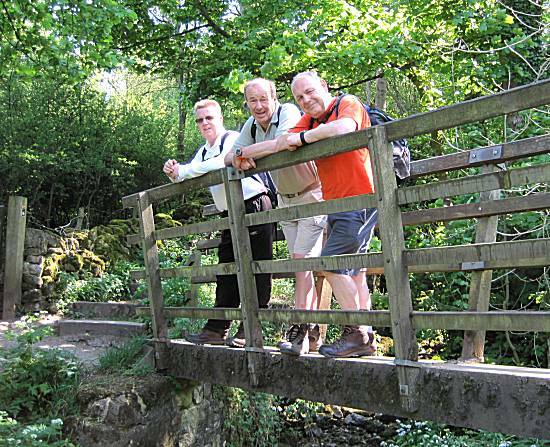 Ron, Alan and Neil duly arrived at the prescribed lay-by near the bridge at Wensley, and eagerly awaited the arrival of Cliff's bacon and chopped fried egg sandwiches being delivered with the Thoralby contingent. A DISASTER OCCURED almost immediately, when Andy announced that he had not procured the necessary pork pie rations to see the walkers through their difficult walk. Despite having claimed that he had previously advised the walkers of this fact, the walkers fell about in despair desperate for a solution to their dilemma. Their leader again quickly took control of the difficult situation and led the walkers over the bridge entering the Bolton Hall grounds, passing the stately hall, crossing Lords Bridge, before right turning along a special permitted path. The walkers were confident of his plan, but were unable to interpret his actions. 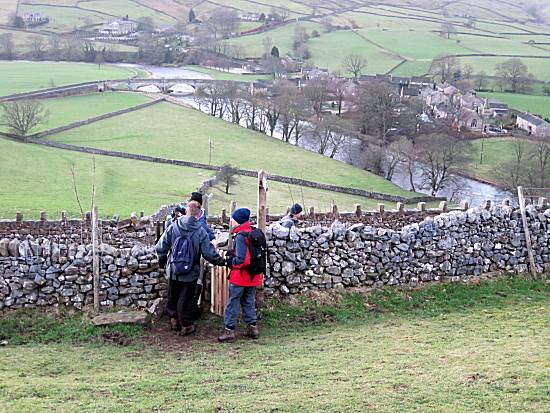 The tall stone wall, without stile, previously encountered on this section was crossed with some difficulty and the group was lead towards Swinithwaite. Here magically, a vision appeared in front of the walkers!!! A Farm Shop selling all sorts of pies!!! The walkers rushed inside and cunningly chose a Game Pie, which the friendly staff divided into 7 portions. Thanks again to the incredible skills of their leader Cliff, a complete disaster was averted. 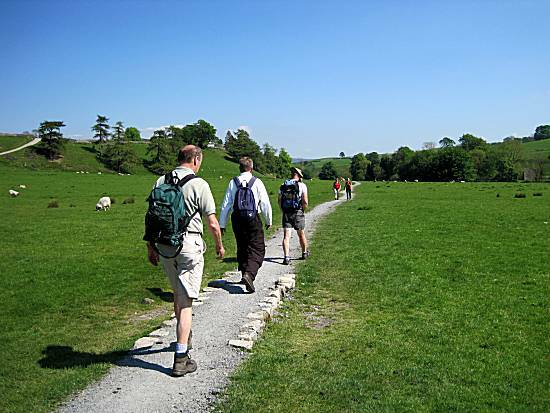 The walkers set off, with added vigour, heading towards the river and the giant Aysgarth Falls. 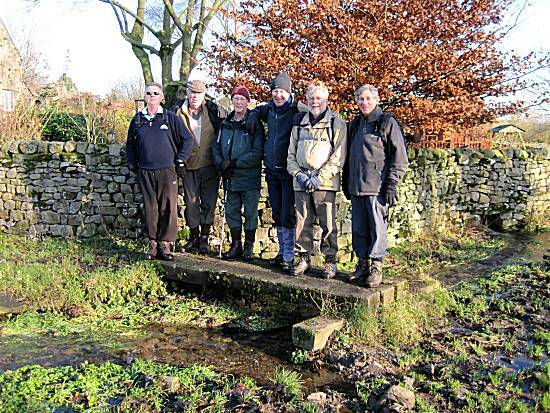 Unable to find a proper bridge they improvised, in order to obtain a group photo. As the walkers continued on their difficult journey, they spotted far in the distance a ruined and long lost castle. They agreed amongst themselves to find and investigate it. 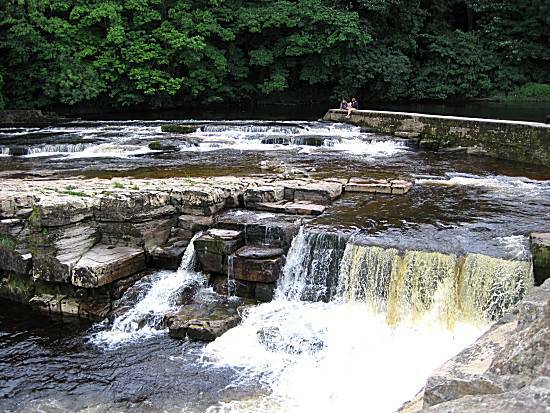 The walkers were comforted by the mighty roar of the giant Aysgarth Falls as they approached the village, passing the church and mill, before crossing the bridge onto the feared north bank, heading towards Carperby. 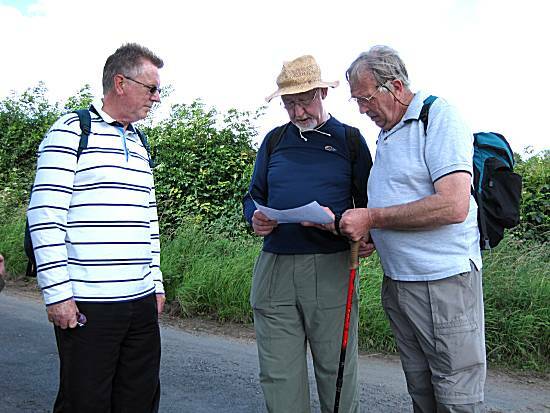 The walkers continued northwards towards Carperby, aware that yet another waterway had to be crossed. 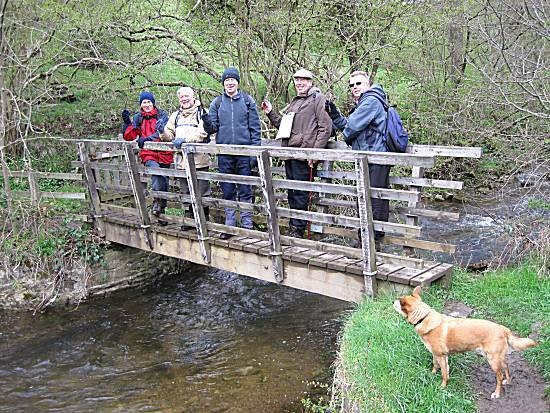 The walkers were confident that the makeshift bridge, built by the village folk of Carperby, over the dangerous waterway would not collapse. 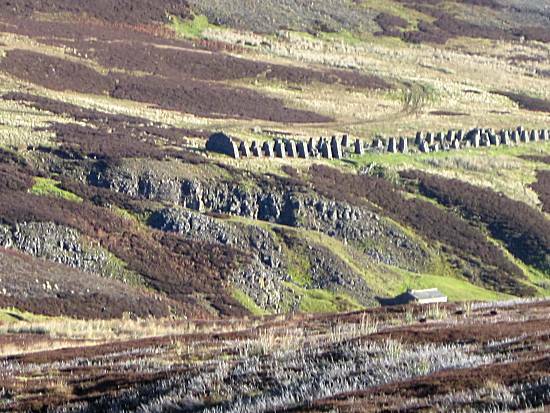 Treacherous pathways led the walkers towards the ruined castle, seen in the distance. On arrival, the walkers were horrified to find the poor state of the former castle and having made such incredible progress decided to use their spare time before lunch by re-building it. 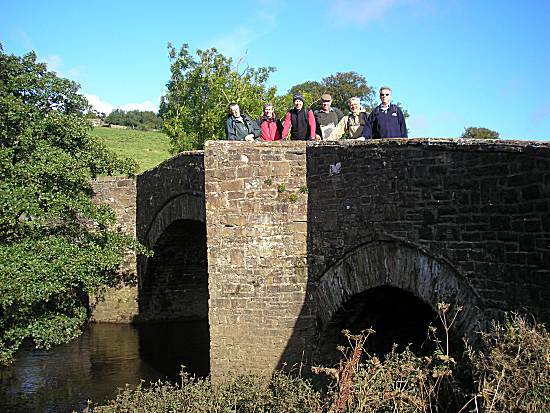 The journey back to Wensley was completed with added vigour, as further bridges were encountered and conquered. 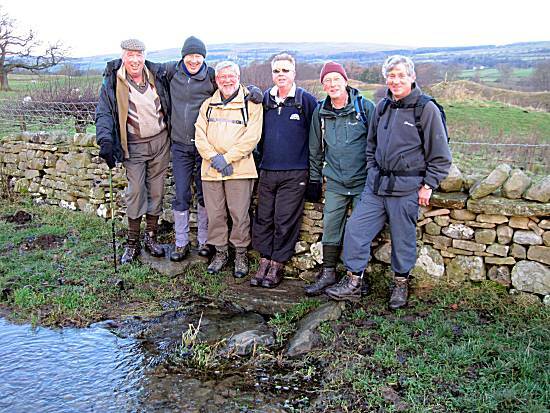 The walkers wished each other compliments of the season as they departed, having agreed to walk again on their infamous Coverdale Christmas walk on the 29th December. 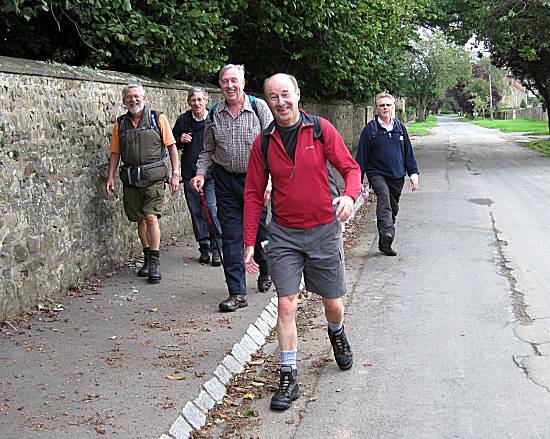 Walkers: Cliff (Leader), Andy, Paul, Alan, Neil, Colin & Ron (without Ella the dog). 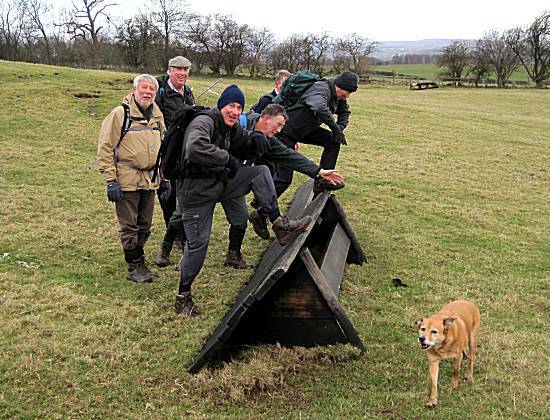 The walkers arrived at the prescribed meeting place of the lay-by near Leyburn eager to tuck into Ron’s bacon, egg and sausage sarnies, however, within seconds a DISASTER OCCURED, when our leader for the day, Cliff, advised that the path back across the fields from Spennithorne was impassable due to the treacherous flooded conditions. Again using his usual commanding voice, he took full control of the dangerous situation by instructing all the drivers to take their cars to the relative safety of the Cover Bridge Inn car park. Upon arrival they immediately set about devouring Ron's still warm sarnies, much to their great appreciation. 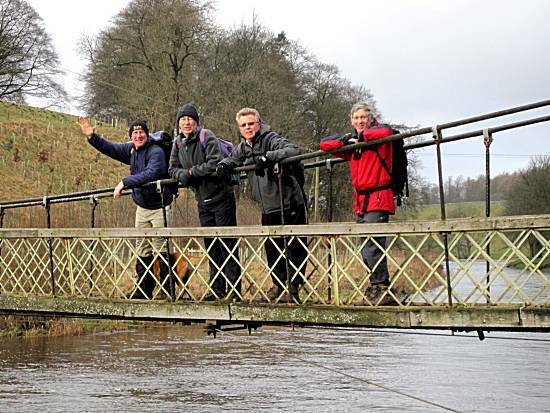 Cliff led the walkers on an unknown route, quickly crossing the bridge over a very swollen River Ure where they stopped for a statutory group photo. Moving on they soon passed Danby Hall and into the village of Thornton Steward before following the path down to Kilgram Bridge, where they again crossed the very fast flowing River Ure, before heading up towards Ellingstring. 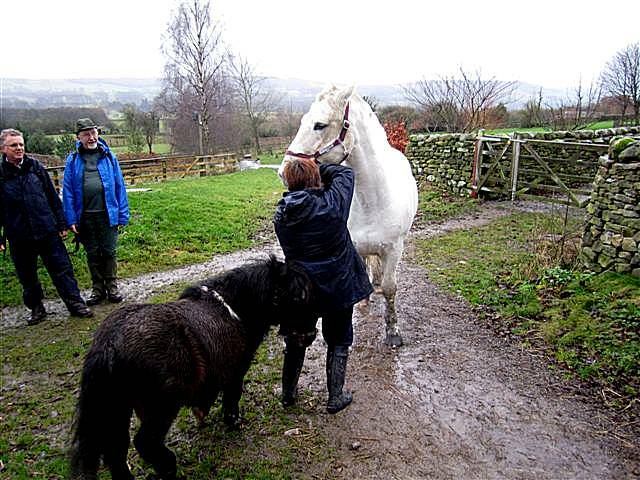 The walkers soon met a lady leading two horses - she advised that the white one was called 'Big Boy', while the walkers pondered on what the black one might be called. Despite pleading requests and offers to make it worth her while, the lady declined to take the walkers on horse back across the adjacent waterlogged field. 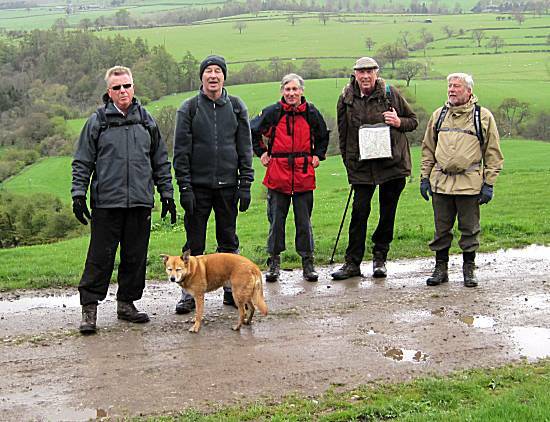 On reaching the Masham to East Witton road, energy promoting mars-bar crispies were required and enjoyed before the group agreed to walk along the road for a short distance, due to the intolerably wet and squelchy conditions underfoot and the persistent rain. 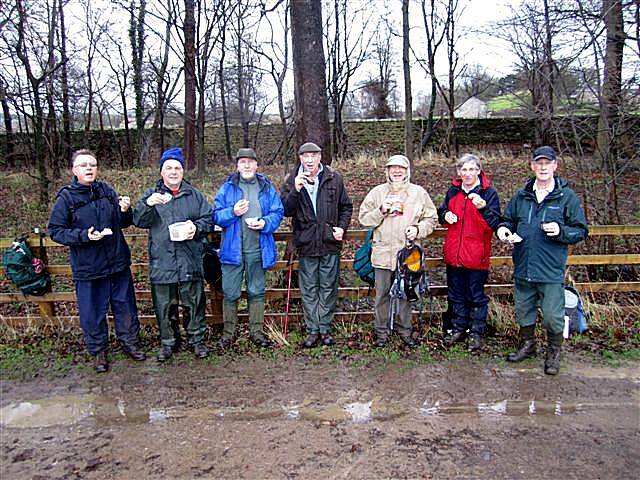 On reaching Jervaulx Park, the walkers felt need of an elevenses stop, where portions of Christmas cake, with added cheese, were enjoyed, kindly prepared by Tom’s wife. Several of the walkers partook in further portions of mars bar crispies. 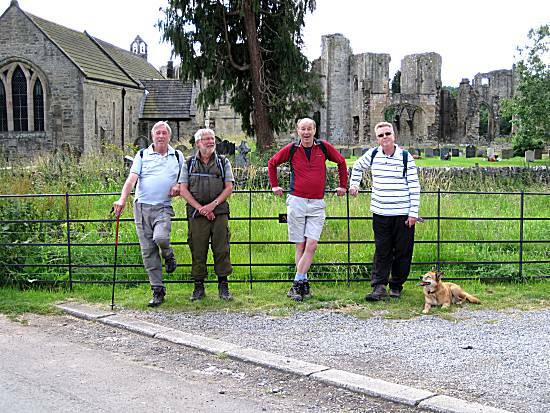 Refreshed the walkers continued on the path passing Jervaulx Hall and the remains of Jervaulx Abbey before joining the track alongside the River Ure. They followed the path for sometime and were heard remarking about how quickly the river was flowing and how high it was, lapping at the top of the river bank. The walkers were unconcerned even when they witnessed locals heading upstream at great speed in boats disguised as trees!! The walkers choose to ignore the threat, knowing that they would be unable to catch them, in the difficult conditions. 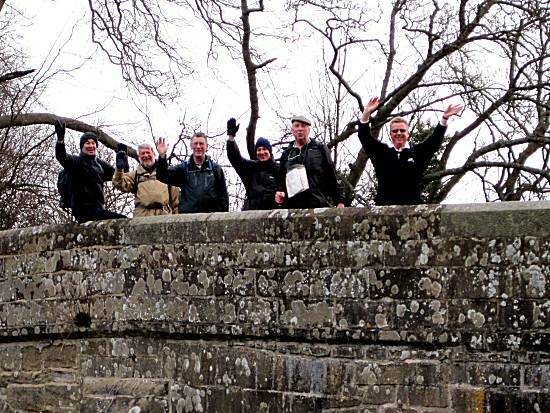 Incredible jubilation was experienced when the walkers saw the their lunchtime stop, the Cover Bridge Inn, come into view, much lifting their spirits. 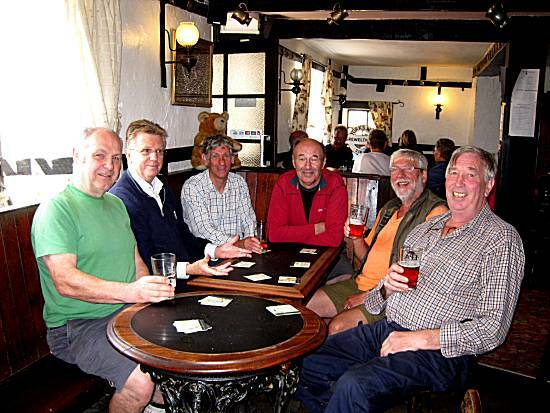 The group received a very warm welcome from landlord Nick, as they settled down adjacent to the roaring log fire to enjoy the fine ales on offer (except Alan). 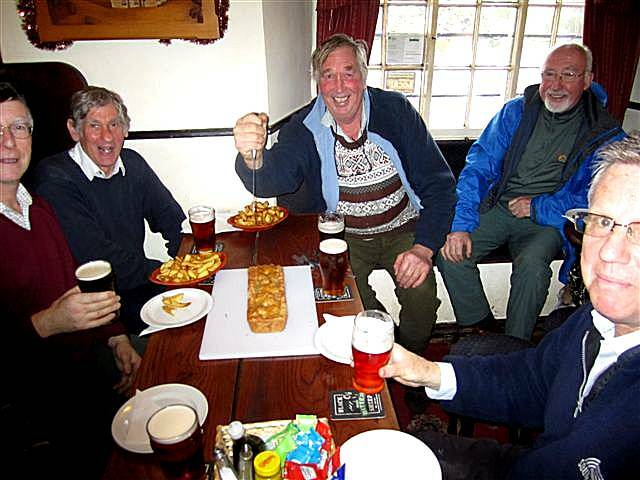 The walkers could not hide their excitement when Cliff's exceedingly delicious home-made pork pie, made to an exceptionally high standard, was brought in by the envious pub staff. Considerable exhilaration was experienced by all, as the pie was shared amongst the walkers, accompanied by portions of fine chips together with a special Belgian pickle (Piccalilli style). The walkers showed little concern as they looked out of the pub window at the rain tippling down, knowing that they did not have to walk back to the originally planned starting place. Before long, Andy’s wife and Tom’s wife together with two sons arrived to collect the Dales contingency. Refreshed and somewhat earlier than usual due to the poor weather, the group headed homeward bound. 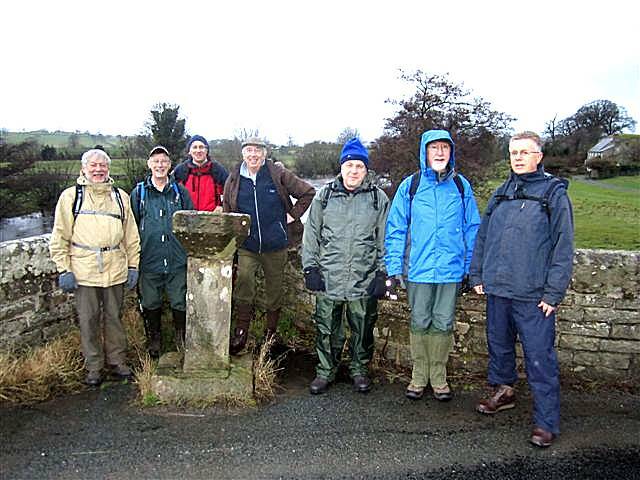 The walkers agreed that this had been another successful, although rainy day’s walking, which they considered must have been the wettest underfoot that they had ever experienced. Weather: Rain all day with unbelievable mud!! Walkers: Cliff (leader), Andy, Paul, Colin, Tom, Ron, Alan and Neil.